The authors of this article, James M. Coyne, Robert C. Yardley and Jessalyn Pryciak are consultants with Concentric Energy Advisors Inc. This article is based on a longer research report supported by the Canadian Gas Association and the Canadian Electricity Association. Where articles are funded by a particular organization it is the policy of this journal to invite a Commentator to provide a neutral perspective. In this case the Commentator is Professor Adonis Yatchew of the University of Toronto, a well-known writer in energy economics and Editor -in- Chief of the Journal of Energy. His comments follow the conclusion at the end of the article. The case for utility-led, ratepayer-funded innovation has strengthened over the past decade and is being driven by a series of interconnected energy realities. These include the need to employ technology to integrate significant quantities of customer-sited distributed energy resources, the emergence of new natural gas end-use technologies, and a recognition by governments that utilities can play a central role in the achievement of energy and environmental public policy goals that require innovative solutions. These factors have taken hold among global economic regulators and this report concludes that the trend is spreading beyond some of the early movers. The responsibility for ensuring that innovation prepares the energy industry to realize the potential for reliable, affordable, and clean energy with greater customer choices among products and services is shared by the utilities, regulators and other policy makers. In an earlier report,1 we described the significant benefits that energy innovation provides to customers and society with benefit-to-cost ratios in the 2 to 5:1 range across several programs. The report provided a framework for evaluation of alternative funding mechanisms, focusing primarily on government (taxpayer) and utility (customer) funding options. Government funding is most appropriate in the high-risk early research and development phase or where there are significant spillover benefits that discourage risk-taking. Utility customer funding is most appropriate where the benefits largely accrue to utility customers and where they are in a unique position to test new technologies and business models. The report identified potential obstacles to utility innovation and recommended a utility customer-funding model that maintains active regulatory oversight. Two subsequent updates (2015 and 2016) provided updates on trends in utility-sponsored innovation along with examples of recent projects. This 2018 report focuses on customer-funded innovation programs with a deeper dive into the reasons why regulators in eight jurisdictions support customer-funded innovation. These include four leading United States jurisdictions (California, New York, Minnesota, and Massachusetts), two Canadian provinces (Ontario and British Columbia), and two international jurisdictions (Great Britain and Australia). We supplemented regulatory research with regulatory and policy interviews in these jurisdictions to obtain perspective on whether the programs were working, and indications of results achieved to date. It is becoming increasingly accepted that new business models need to be developed, enabled by energy and data system technologies that require development and testing before they can be deployed at scale. Network infrastructure (pipeline and wire) modernization is an explicit goal for utilities and regulators, for both gas and electric utilities. Future investments in the networks are being designed to support an unfolding market characterized by engagement of both customers and third parties in the utility business model and the implementation of new consumer products and services. Utilities can support this evolving market via rate-funded demonstration projects that test new technologies and business models. Generally, while innovation in energy technologies and less expensive ways of performing traditional utility activities continue to grow, there has been more focus in the past few years on integration of demand energy resources, new business models, and the security of “big data” that enables this transformation. These programs de-risk investments for both customers and shareholders and help establish the business case for full-scale technology development and market adoption. Utility-led technology deployment and demonstration activities will have important direct benefits for customers by improving the way their customers use energy, control their energy use and derive benefit from it. Further, we are seeing many national and subnational governments developing large technology and funding programs. Utility ratepayer funding offers an opportunity to leverage these funds. Regulators have another important objective with innovation: to spur a transformation of utility cultures to become learning and innovative organizations. Electricity and natural gas “utilities of the future” will be required to leverage advancements in energy technology, big data, and the desire of consumers to be evermore involved in their energy use patterns. Regulators also cite a desire to increase the reliability and resiliency of utility service and improve environmental performance. The United Kingdom regulator concluded that its earliest efforts at innovation, the Low Carbon Network Fund (LCNF), which aimed to achieve aggressively low carbon goals, demonstrated that regulation has a critical role in promoting utility innovation and removing existing barriers for utilities. California has long been a supporter of customer-funded demonstration projects and continues this effort. New York’s policy makers have implemented longer-term research and development programs, and requested that the regulator adopt a longer-term perspective when evaluating ten-year business plans that can be reprioritized during the plan as experience is gained. Minnesota has engaged a stakeholder process to contribute to the design of demonstration projects before they are submitted for review by the regulatory commission, thereby improving the opportunities for learning by all parties. AVANGRID, for example, is developing a demonstration “Energy Smart Community” that will test new customer engagement and business models after it installs Advanced Metering capabilities for over 10,000 customers in Ithaca, New York. Australia has supported customer-funded innovation that aims to reduce peak demand as growth is threatening reliability and will require expensive infrastructure investments. Ontario currently funds innovation through a combination of customer, utility shareholder, and vendor funding. The Ministry of Energy recently published a 2017 Long Term Energy Plan that focuses more intently on the role of innovation, and the potential barriers presented by existing regulation. The Massachusetts Commission has recently signaled its willingness to fund demonstration projects, indicating a willingness to follow through with a policy that was established in 2014 by a prior Commission. In British Columbia, an ambitious provincial clean energy policy has provided flexibility for utilities to propose – and the regulator to approve – customer-funded innovation projects in areas such as renewable natural gas and natural gas for transportation. These projects are seen as precursors to kick-starting new technologies and new applications of those technologies that may ultimately lead to scaled-up competitive markets. Table 1 identifies programs in each of these jurisdictions where regulators have made an explicit determination that they meet specific innovation or demonstration project requirements to merit customer funding. *Start dates vary by gas vs. electricity, and transmission vs. distribution. In considering these funding levels, policymakers and regulators might ask: what is the optimal level of funding, which programs are most successful, and what factors determine whether funding should be increased or decreased? These are important questions without easy answers, but our research In considering these funding levels, policymakers and regulators might ask: what is the optimal level of funding, which programs are most successful, and what factors determine whether funding should be increased (or decreased)? These are important questions without easy answers, but our research sheds light on them. Where energy policy dictates a shift in the status quo, funding levels would be expected to be higher to facilitate the transition, and targets comparable to the CA-NY-MA range may be appropriate. Given the relatively new nature of utility funded innovation, it is difficult to measure success, but Ofgem programs appear at the forefront, with benefits for certain programs estimated in the 4.5-6.5 times funding level range. Capital investment theory stipulates that any investment with a positive return should be undertaken with risk and capital costs factored in. This suggests that program funding up to a return ratio of 1:1 is warranted. Even with current budgets, California has estimated its RD&D funding gap is as much as $670 million per year. As long as estimated benefits continue to exceed funding levels, policymakers and regulators are serving the public interest. Overall, this report documents the trend toward increased customer funding of innovation projects in both the natural gas and electricity industries and cites the rationale relied upon by policy makers and regulators. In some jurisdictions, the changes are implemented through a combination of legislation and regulation. The potential returns from innovation are significant. Whether avoiding costly investments in infrastructure, or helping customers save money on their bills by utilizing technology to manage their energy use, regulators are concluding that the short- and long-term benefits clearly justify the costs of demonstration projects. The following sections describe the approaches taken in each jurisdiction and insights gained from evaluation of these programs. The United Kingdom’s energy regulator, the Ofﬁce of Gas and Electricity Markets (“Ofgem”), has been an international leader in regulatory reform since its predecessor agencies were established when natural gas and electricity markets were privatized in the 1980s. Notably, it was an earlier adopter of performance-based regulation (“PBR”). The most recent version of this multi-year utility revenue model is “RIIO”, representing the equation, “Revenue = Incentives + Innovation + Outputs”, which was applied to natural gas and electricity distributors in 2013 and 2015, respectively. This new model was the result of a “[email protected]” review of PBR as applied in the UK. During this same era, Ofgem and the U.K. utilities gained experience with the Low Carbon Network Fund (LCNF). Ofgem established two distinct innovation funding programs to implement the innovation component of RIIO: the Network Innovation Allowance (NIA) and the Network Innovation Competition (NIC). These two programs fund research by the Distribution Network Operators (DNOs) that will facilitate the transition to a low carbon economy, while providing cost savings to customers. Customers will pay for these activities through their energy bills. The NIA is for funding smaller innovation projects and is a set annual allowance available to each network operator. The NIC is an annual competition to fund selected innovation projects, and is focused on larger, more complex projects that require approval. The UK government, through Ofgem, has made utility innovation a key objective of its regulatory framework. The regulator wants to drive cultural change at utilities in order to create a smarter, distributed, renewable, sustainable, efficient, and diversified electric and gas grid for the benefit of customers. Utility customer funding is utilized along with co-funding from third party vendors. The goals and scope of the UK program are among the most ambitious examined. California has two large programs that fund RD&D in the energy sector. The CES-21 program is a collaborative effort among the three large investor-owned utilities and Lawrence Livermore National Laboratories (LLNL) that funds investments in several specified areas, focusing most recently on cybersecurity and grid integration projects. The Electric Program Investment Charge (EPIC) Program funds investments that promote the adoption of clean technologies. Both programs are reviewed and approved by the California Public Utilities Commission (CPUC) and rely on customer funding. CES-21 funding in 2016 was $10.3 million, divided among the approximately 11.9 million customers of the three IOUs, results in a funding level of $0.87 per customer. EPIC’s annual budget of $162 million translates to funding of approximately $13.61 per customer. California is a leader in customer-funded innovation. The California CES-21 program demonstrates that enabling legislation can achieve two objectives: 1) clarifying the authority of a regulatory agency to approve RD&D expenditures by utilities and 2) establishing guidelines that a regulatory agency can apply in approving specific proposals. However, it also demonstrates that legislatures can subsequently modify their perspectives with respect to the amount and focus of RD&D. In this instance, the decision to reduce funding of the CES-21 program appears to have been caused by concerns about the proportion of the funding that was being used to fund administrative costs. New York supports customer-funded RD&D projects in both the natural gas and electric industries. There are several categories of funding. The seminal order establishing competition in New York’s electric and natural gas industries (Order 96-12) established a non-bypassable systems benefits charge (SBC) from customers to fund research and development as well as energy efficiency investments, low-income programs, and environmental monitoring. The New York State Energy and Research Development Authority (NYSERDA) was designated in 1998 to administer the SBC funds. Prior to that time, utilities performed research and development activities that were approved by the New York Public Service Commission (NYPSC) and funded through customers’ utility bills. New York’s utilities continue to request and receive authorization to perform R&D activities that are approved in their rate cases. In 2000, the NYPSC approved a surcharge intended to fund medium-to-long-term R&D by New York’s investor-owned natural gas local distribution companies (LDCs) in response to a decision by the Federal Energy Regulatory Commission to phase out support for the Gas Research Institute through a surcharge on interstate pipeline deliveries.14 New York’s LDCs pledged to work collaboratively to address common needs and avoid duplication of research activities. The NYPSC relied on a Staff recommendation to have funds directed to distribution activities, and not to upstream activities (i.e., supply and storage) or to improving end-use appliances that were considered competitive activities. An appendix to the recommendation provides a list of qualifying distribution activities that includes pipe installation, pipe repair and maintenance, modeling of pipe flows, and improvements that would address environmental impacts related to the distribution function. This effort came to be known as the Millennium Fund. An industry trade group estimated that the benefit-to-cost ratio of gas R&D projects was approximately 3:1. The Millennium Fund remains in place today. Millennium Fund programs are supplemented by utility-specific natural gas R&D programs that are approved in individual LDC rate cases. For example, Consolidated Edison proposed the deployment of trenchless technologies that allow the companies to repair gas distribution lines without digging a trench. Central Hudson has proposed to test a “non-pipes alternatives” concept as a way to meet growing peak demand on constrained parts of their system. New York’s support for innovation experienced a renaissance with its “Reforming the Energy Vision” (REV) proceeding that began in 2014. Customer-funded RD&D occurs through two mechanisms: (1) REV demonstration projects proposed pursuant to the Track 1 Order in the REV proceeding, and (2) RD&D efforts organized and managed by NYSERDA and funded by the SBC. REV demonstration projects were filed pursuant to guidelines established in the REV Track 1 Order issued on February 26, 2015. The REV proceeding is New York’s broad-based initiative to leverage technology and business model innovation in order to integrate substantial amounts of “Distributed Energy Resources” and thereby enhance reliability and resiliency while lowering carbon emissions. Cap on REV demonstration project cost recovery of 0.5 per cent of total revenue requirements, or $10 million per year. The electric industry is in a period of momentous change. The innovative potential of the digital economy has not yet been accommodated within the electric distribution system. Information technology, electronic controls, distributed generation, and energy storage are advancing faster than the ability of utilities and regulators to adopt them, or to adapt to them. At the same time, electricity demands of the digital economy are increasingly expressed in terms of reliability, choice, value, and security. Policy makers were particularly interested in demonstrating that the industry could transition to a new business model without having an adverse impact on reliability. NYSERDA recognizes that utility participation in RD&D is critical to the ultimate goal of new technologies and business models being deployed for the benefit of customers who are funding the research through the SBC. There is a tension between the uncertainty and risk associated with RD&D and the cost-benefit analysis that regulators typically apply to more traditional utility investments. The longer timeframe associated with returns to RD&D also present a challenge as regulators are generally looking for some measurable customer or environmental benefit (e.g., a specified carbon reduction quantity) within the first five years. Although NYSERDA is a state agency, its budget and activities are subject to review and approval by the NYPSC. As part of the Clean Energy Fund review, NYSERDA has received approval to apply a ten-year business planning horizon to its portfolio of programs. NYSERDA will file annual, rolling updates to its portfolio, adjusting priorities in response to technology and market developments, and defunding programs that no longer appear promising. This longer horizon is more aligned with the risk associated with RD&D, and also provides greater certainty and continuity as the NYSPC grows more comfortable with NYSERDA’s portfolio approach. The New York approach to innovation requires that the NYPSC apply a different perspective to its review and oversight of RD&D than it takes to its more traditional approval actions. The Commission is being asked to adopt a higher risk tolerance on behalf of customers based on the belief that customers will benefit in the long run from innovation and that, absent customer-funding, a suboptimal level of RD&D will occur in the regulated utility segment. New York has promoted utility innovation through multiple programs targeting both the gas and electric industries. While New York policy makers are pressuring the utilities to be innovative, they are also keeping utilities firmly within a cost-of-service regulatory environment. The introduction of potentially disruptive market and regulatory models is a concern among utilities as DERs continue to be integrated throughout the state. The issue may be brought to a head with NYSERDA taking a more active policy role in an effort to sustain the momentum toward increasing innovation. Minnesota has two initiatives that provide customer-funded RD&D projects: a Renewable Development Fund established in 1994, and a more recent effort to develop demonstration projects through extensive stakeholder participation as part of Minnesota’s e21 initiative. This initiative is addressing the future of energy market more comprehensively by examining changes to business models and regulatory frameworks necessary to leverage new technologies to promote a sustainable future with greater reliance on customer-sited and other renewable energy supplies. For the RDF, there is a $25.6 million annual contribution to the fund. In 2017 the RDF charge for a typical customer was $0.76 per month, equaling $9.12 per year. The RDF’s objective is to remove barriers to entry for renewable energy technologies, including economic barriers from competing against conventional energy sources. The e21 approach to innovation tests the value of including stakeholders in the design and development of demonstration projects, particularly when the objective is to test a new business model or a new way for utilities to work with third-parties, or when the demonstration project is testing the engagement and responsiveness of customers to new products and services. Although specific demonstration projects still need to be reviewed and approved by the MPUC, the stakeholder experience improves the design of the projects and increases their eventual likelihood of success. Stakeholders engage directly with the utility throughout this facilitated process and are in a position to support regulatory approval, including ratepayer support. The benefits of improved stakeholder relationships can carry over to more controversial utility regulatory matters that employ stakeholder engagement, including integrated resource planning efforts. This type of engagement has the potential to reduce regulatory risk and regulatory lag that is exacerbated by lengthy litigation. One byproduct of the e21 Initiative is legislation that codifies the authority of MPUC to approve multi-year rate plans, extending the maximum from 3 to 5 years, and requires any such plan to include a distribution system plan.15 This legislation, the 2015 Jobs and Energy Bill, also provides the MPUC with the authority to develop performance metrics for utilities.16 The identification of measures, specific metric definitions, and targets all benefit from stakeholder engagement outside of a more rigid litigation process. Thus, the e21 Initiative has effectively created a role for itself that complements rather than competes with the more traditional relationship among the regulator, utilities, and stakeholder intervenors. The issues faced by utilities and their regulators are expected to become increasingly complex as energy business models continue to evolve in response to technology and market developments. Minnesota, with the e21 initiative, is increasing the likelihood that regulators will be willing to approve customer-funded innovation by increasing the degree of collaboration between the utilities and stakeholders, and by beginning the collaboration while the demonstration projects are still in the design phase. DMIA funding is AU$200,000 plus 0.75 per cent of annual revenue requirements (ARR). DMIS funding is up to 1 per cent of ARR. Despite these incentives, the AER has found it challenging to move utilities beyond a perceived focus on capital investments, and prior incentives have not been sufficient to overcome that hurdle. There is a cultural resistance. The AER is attempting to promote innovation through the DMIA and also wants to distinguish between services that should remain under regulation, and those that should be competitive, as described in its ring-fencing guidelines. The driving forces impacting utility regulatory policy in Australia are consumer concerns regarding energy prices, reliability concerns, pending retirements of coal-fired plants and the growing penetration of renewables. The existing regulatory model is a multi-year incentive program. Companies come in every five years with forecasts for the next five years. The regulator, with technical advisors, determines if the forecast reflects “efficient costs,” and then sets revenue for five years. The underlying rationale is if the utility can improve on costs, they retain the difference, and if there is a non-network alternative that’s more cost-effective, the utility has the incentive to look at that alternative. The AER is seeing more partnering between the networks and different innovators, and the networks are becoming more open to innovation. The AER sees its role as setting up a framework, and the industry is responding. The AER is also emphasizing a movement away from an adversarial relationship to a more collaborative model. Pilot projects are beginning to illustrate scalability. Tesla, for example, is building a 129-MWh battery with French energy company Neoen in South Australia, characterized as the world’s largest battery. Australia also funds RD&D projects as a result of the ARENA Act 2011, which targeted $2 billion (Australian dollars, equal to approximately $1.97 billion Canadian dollars) to invest in renewable energy and the Australian renewable technology sector. Funding has been modified by the Clean Energy Legislation (Carbon Tax Repeal) Bill 2013 and Budget Savings (Omnibus) Bill 2016. Australia is poised to implement customer-funded innovation mechanism at a meaningful level. This proposal is broadly supported by stakeholders who recognize that utility innovation is part of the solution to adapt to a changing environment. This includes targeting a combination of energy costs, reliability, and the integration of renewable energy resources. A combination of government-funded, customer-funded and industry-led mechanisms are being utilized. Ontario currently funds innovation through a combination of ratepayer, utility investor, and third-party vendor resources. Ratepayer-funded projects are financed through the IESO’s Conservation Fund and are included as a component of the Global Adjustment charge that appears as a separate line item on electric bills for all customers. More recently, the provincial government of Ontario and its energy regulator have increased their attention on the role that innovation needs to serve in the energy sector. The Ministry of Energy’s 2017 Long Term Energy Plan (2017 LTEP), released in October 2017, devotes an entire chapter to innovation. Ontario funds innovation through a combination of ratepayer, utility investor, and third-party vendor resources. Ratepayer-funded projects are financed through the IESO’s Conservation Fund and are included as a component of the Global Adjustment charge that appears as a separate line item on electric bills for all customers. Recent demonstration projects that have been funded through this mechanism include several pilot programs that test TOU and other pricing mechanisms (often combined with energy management system technologies). They also include testing new energy technologies such as energy storage and the potential for solar power to defer infrastructure investments. Ontario is focused on maintaining affordable energy for residential and business customers. Innovation in the delivery of electricity and natural gas, greater customer choice, and expanded access to natural gas, are viewed as major contributors to realizing this goal. The emphasis on innovation responds to stakeholder input that “electricity costs are too high,” the Ministry should “consider new technologies and methods to manage energy use,” and there is a need to “expand access to natural gas.” The Ontario Energy Board’s (OEB) 2017-2020 Business Plan identifies “technological innovation that presents new choices for consumers and challenges traditional business and regulatory models” as one of four key trends that define the current environment. Stakeholders involved generally understand the goals: be cost effective, make the customer’s voice heard, and meet environmental policy goals. An outcomes approach to regulation is compatible with these objectives. The OEB perceives a hangover of existing habits and approaches to distribution planning, and some prior regulatory features that do not provide adequate incentives for least cost systems. Incentives that align customer and utility objectives will drive down system costs. The OEB has also relied on moving more distribution charges to the fixed customer charge to remove barriers to innovation. Governance for pilot projects includes the OEB establishing guidelines, followed by interim reports showing results based on the sample (e.g., how effective is it at demand response and consumer elasticity), followed by a mandatory final report. Monthly monitoring reports are sometimes utilized in the first period, followed by bimonthly reports. Ontario is supporting customer-funded innovation through a broad-based customer-funded mechanism collected through the ISO. The strong positioning of the role of innovation in addressing energy costs in Ontario by the Ministry is important in reaching alignment with the OEB to provide support for innovation. The 2017 LTEP and OEB business plan recognize that regulatory barriers need to be addressed. The regulator is seeking to better align utility and customer interests and the regulatory model through demonstration projects and incentives that will ultimately deliver lower energy costs. As an example, the recent approval of Eversource’s storage and EV projects includes approved capital investments of $100 million. The annual revenue requirements associated with these investments will be recovered from Eversource’s 1.4 million electric customers in Massachusetts. The Department considered bill impacts, net of customer benefits, when approving these spending levels. Notably, the DPU indicated that it would not deny cost recovery “merely because of lack of success,” responding directly to one of the major barriers to utility innovation, noting further that the DPU had not been supportive of RD&D projects in the past, and signaling an intent to reverse existing precedent. Grid modernization would result in lower energy costs by contributing to a less expensive electric system (investments, operations and maintenance expenses), reducing peak demands, and by providing customers with tools that they could employ to reduce their electricity usage. Although the DPU has not yet issued orders in the grid modernization cases filed over two years ago, the Eversource order signals its intention to apply the policies from the prior Commission and its willingness to fund demonstration projects that advance the public interest. Most importantly, this qualifies as customer-funded innovation. It will be a few years before these recently approved projects will produce results that can be evaluated. The funding for Eversource’s storage and EV projects coincided with approval of its PBR plan, indicating innovation and PBR can be pursued simultaneously. The 2007 Greenhouse Gas Reduction Targets Act set initial targets for reductions in greenhouse gas (“GHG”) emissions at a 33 per cent reduction by 2020 and 80 per cent by 2050, and established a carbon tax. The 2010 Clean Energy Act (CEA) set goals with respect to electricity self-sufficiency, including reducing the expected increase in electricity demand by at least 66 per cent by 2020, generating at least 93 per cent of electricity from clean or renewable resources, supporting the development of innovative technologies that support the conservation and clean energy goals, and reducing GHG emissions dramatically by 2050. The CEA directs the British Columbia Utilities Commission to set rates as necessary to allow utilities, including British Columbia’s largest electric utility, provincial-owned BC Hydro, to recover the costs they incur to achieve these goals. The Greenhouse Gas Reduction Regulation (“GGRR”), authorized under the CEA, allows for utilities’ prescribed undertakings that work towards GHG reductions, while still allowing them to recover their costs through utility rates. The GGRR allows utilities to implement prescribed undertakings without seeking the prior approval of the BC Utilities Commission, although the Commission still has the ability to rule on the prudency of expenditures. British Columbia’s utilities have provided incentive funding to customers to support development of CNG and LNG fueling stations, vehicle and marine vessel conversions, and the use of renewable natural gas. One fund that is instrumental in achieving British Columbia’s goals is the Innovative Clean Energy (ICE) Fund administered by the Province’s Ministry of Energy, Mines and Petroleum Resources. The ICE Fund is a legislated Special Account designed to support the Province’s energy, economic, environmental and greenhouse gas reduction priorities, and to advance B.C.’s clean energy sector. The ICE Fund was initially funded by a 0.4 per cent levy on the final sales of electricity, natural gas, fuel oil and grid-delivered propane. The electricity levy has since been removed with the reinstatement of the Provincial Sales Tax on April 1, 2013. British Columbia, through a series of legislative actions, has established aggressive goals for its energy sector that depend on investments in clean energy production and infrastructure as well as technologies that support energy management activities. Many of these programs are funded through surcharges on energy usage. A series of legislative and policy initiatives led to the establishment of the Clean Energy Act in 2010, and the subsequent GGRR in 2012. Under this legislation, utilities have the option to implement prescribed undertakings without seeking the prior approval of the BC Utilities Commission, although the Commission still has the ability to rule on the prudency of expenditures. The Province does not contribute any funding. The programs are fully funded by natural gas utilities and paid for by natural gas customers. The GGRR has been amended over time to allow utilities to implement specific undertakings. In November 2013, amendments were made to allow utilities to expand their incentives to include trains and mine-haul trucks, and to provide tanker-truck delivery services to trucking, mining and marine-transportation customers. In May 2015, the Government further amended the GGRR to allow for shifts in the allocation of incentives and investments within the previously-approved total spending cap in order to better respond to changes in the marine market place. Amendments made in early 2017 enabled utilities to increase natural gas distribution to the marine transportation sector. Amendments also increased incentives for using RNG in transportation and established a Renewable Portfolio Allowance to increase the supply of RNG. Utilities provide comprehensive reports on these initiatives to the provincial government and the commission. In British Columbia, an ambitious clean energy policy has provided flexibility for utilities to propose – and the regulator to allow – cost recovery for customer-funded innovation investments. These projects are seen as precursors to kick-starting new technologies and new applications of those technologies that may ultimately lead to scaled-up competitive markets. Several policymakers, including utility regulators, have recognized the need for utilities to actively contribute to innovation in the electricity and natural gas sectors of the economy and the value this provides to customers. This report focuses on jurisdictions that provide customer funding for innovation and the reasons that regulators have cited in approving this funding. They have approved funding for demonstration projects that explore new business models, pilot technologies that result in delivery efficiencies, test new products and services, and support scalable investments. All of these investments help accelerate the pace of change in the sector. Goals for these programs vary by jurisdiction, but common themes include: greenhouse gas reductions, lower energy prices, demand reduction or load shifting, accelerated deployment of renewable and distributed resources, improved system reliability, and the introduction of new utility technologies. Rationales also vary according to specific circumstances and preferences of regulators and policymakers. Ofgem sees innovation funding as a vehicle for driving cultural change at utilities, and necessary to achieve these objectives. California and BC see innovation as a mechanism for economic development. BC and Australia see innovation as a path for stimulating competitive service offerings. Ontario and Massachusetts emphasize new choices for consumers. There is a growing recognition that customers are long-term beneficiaries from innovation in the utility business model, so investments on their behalf are justified and in the public interest. Customer funding for innovation-related projects is often applied in conjunction with funds that are contributed by government and third-party vendors. The history of utility customer-funded innovation funding is relatively recent, so data on the benefits of these programs can be difficult to quantify. Successful deployment requires regulatory flexibility and appropriate governance to ensure the trade-offs between costs and impacts on rates are justified. Given the global nature of these policy objectives, the opportunity exists for lessons learned to be shared among regulators and industry stakeholders. While not all demonstration projects successfully prove out a new technology or business model, these investments frequently prove to be gateways to new utility models, short-term accelerators to competitive service offerings, or some combination of quantitative and qualitative benefits. The potential gains from adaptation of new technologies and business approaches to a “mature” industry are large, and studies indicate the potential consumer benefits from RD&D outweigh the costs by up to 5:1 multiples. Whether avoiding costly investments in infrastructure, or helping customers save money on their bills by utilizing technology to manage their energy use, regulators are concluding that the short- and long-term benefits of customer-funded innovation justify the costs. Innovation research that can be monetized, through intellectual property and ultimately profits, is best funded through utility and/or private sector risk taking. Innovations that do not produce intellectual property, such as is often the case with basic research, require broader support, often through government (or in this case ratepayer) funding. This latter is much like a public goods problem whereby the marketplace does not produce sufficient quantities of a good because the full benefits cannot be internalized by the company engaging in the investment. There are unaccounted (yes, in the accounting sense) spillover effects as well as other externalities. In fact, a good deal of innovation expenditure has both features, leading to some intellectual property, but also to deeper and broader knowledge – theoretical and practical – that entails much broader benefits. These gray and overlapping zones exist in part because of the unpredictability of innovation itself. Many innovations that brought about the enormous growth in productivity during the course of the 20th century, were the result of a delicate interplay between privately and publicly funded R&D. Electricity industries are in the midst of technological [r]evolutions, driven by the ongoing innovations in distributed energy resources (DERs) including in storage and micro-grids. These are scale phenomena (else how could they be distributed). That such resources can be successfully integrated into grids is itself a product of another revolution, the information revolution, one that benefited very considerably from public funding. Contrast innovation in electricity to two other game-changing revolutions – the multi-faceted and ongoing IT and telecom revolution; the other in hydrocarbon extraction, namely fracking. The IT/telecom revolutions were facilitated by public spending, e.g., on university research and on military technology. These technologies were adapted and evolved for commercial purposes by private companies. Declining unit costs and new, and very attractive features (mobility and data availability) made regulation less politically challenging. The question was how to stage deregulation in a way that would not create power vacuums and consolidation of disproportionate market power. The fracking revolution which first upturned North American natural gas markets, and more recently oil markets, was very much a consequence of private investment in innovation, driven by increasing prices. The potential (i.e., ex ante) private benefits to being able to capture cost-effectively these hydrocarbon molecules were enormous. Even after world prices collapsed in 2014 innovation continued, pounding down (and horizontally) shale oil extraction costs. 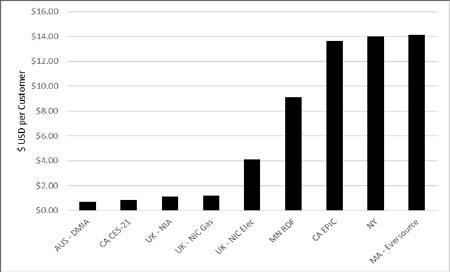 Electricity markets on the other hand are likely to remain heavily regulated for the foreseeable future, existing assets are long-lived and cost pressures are increasing.20 This certainly creates a challenge for policy makers and for regulators seeking to support ratepayer funded innovation, especially if the benefits are likely to be spread over multiple years and may not be immediately visible. Nevertheless, the enormous potential for broader benefits and spill-over effects, even at the geopolitical level (sic), as well as the environmental policy imperatives, make a strong case for publicly funded research. In this connection, I do not quibble between ratepayer vs. taxpayer funded support, though this distinction merits a discussion of its own. If anything, we are under-investing in electricity-related innovation, and I intend this to include electrification of the transportation sector, by far the hardest ‘nut to crack’. Indeed, since the era of deregulation, research expenditures as a share of total revenues of electricity utilities has declined in many jurisdictions. The second contention made by the authors is that innovation should be “utility-led”. One of the important features of recent developments in electricity industries is the increasing interrelationship between DERs and the grid itself. Efforts to deregulate electricity industries were premised on the proposition that wires were natural monopolies and that generation was amenable to competition. This in turn led to their separation.21 Whatever economies of scope may have been present in vertical integrations were foregone. In today’s world, there appear to be increasing economies of scope between DERs and the grid because of complex and evolving integration issues. Consider for example storage which can supplant traditional grid investments, provide backup power, reduce the need for capacity investments, improve reliability, facilitate the integration of renewables, and so forth. These ‘multi-product’ features of storage imply a very close relationship with the grid, in turn strengthening the argument for utility-led innovation. Arguably, these economies of scope provide an important part of the conceptual basis for the rhetorical question ‘who is better positioned than utilities to promote integration and adoption of storage technologies’. A sensible regulatory model applies the principles of incentive regulation to induce innovation itself (such regulatory models exhibit what economists call dynamic efficiency). Historically, the objective was to drive productivity growth. In a world of disruptive technological change, multi-product output and the potential for significant economies of scope, the regulatory tasks of detailed oversight of investment trade-offs, and rates and charges for the various kinds of outputs and services can be overwhelming. Conventional incentive regulation (such as price-caps) needs significant adaptation to accommodate these new realities. Critical to its success is allowing utilities to engage in innovative investments and to be rewarded by the retention of their share of the financial benefits arising therefrom. The authors of this paper have produced an admirable piece of work, arguing the case for utility-led and ratepayer funded innovation. The fruits of such investments of course need to be shared with ratepayers; this would normally be the case whether the utility is privately or publicly owned, and whether the regulatory model is rate or return, or incentive regulation. An argument could also be made that contributions by taxpayers can be justified on the basis of the broader societal benefits of these innovations. Finally, and in future work, the analysis could be further illuminated by incorporating discussion of other jurisdictions where policy makers seek different mechanisms for promoting innovation. *Adonis Yatchew’s research focuses on econometrics, energy and regulatory economics. Since completing his Ph.D. at Harvard University, he has taught at the University of Toronto. He has also held visiting appointments at Trinity College, Cambridge University and the University of Chicago, among others. He has written a graduate level text on semiparametric regression techniques published by Cambridge University Press. He has served in various editorial capacities at The Energy Journal since 1995 and is currently the Editor-in-Chief. He has advised public and private sector companies on energy, regulatory and other matters for over 30 years and has provided testimony in numerous regulatory and litigation procedures. Currently he teaches undergraduate and graduate courses in energy economics, graduate courses in econometrics and ‘Big Ideas’ courses on energy and the environment with colleagues in physics and classics. In June 2018 the International Association for Energy Economics presented him with its Award for Outstanding Contributions to the Profession. Stephen Caldwell, Robert Yardley, Jr., & James Coyne, “Stimulating Innovation on Behalf of Canada’s Electricity and Natural Gas Customers” (2014) Concentric Energy Advisors discussion paper prepared for the Canadian Gas Association and the Canadian Electricity Association, online : <http://44f0gi3luy7z39sz523bbcjn.wpengine.netdna-cdn.com/wp-content/uploads/2015/10/CGA_CEA-Report.pdf>. US, Office of Ratepayer Advocate, Policy Position on CES-21, online: <http://www.ora.ca.gov/general.aspx?id=2422>. Caldwell, Yardley, Coyne, supra note 1 at 2. Massachusetts – Eversource spending represents costs of recently approved electric vehicle and energy storage projects. The UK NIC Electric is decreasing funding from ₤90 million to ₤70 million – this decrease is not reflected in the chart. UK NIA funding uses SGN Scotland and SGN Southern NIA expenditure as an example. New York data represents NYSERDA funding for the most recent year (significantly lower than the previous year as a result of a funding mechanism logistical change), plus ConEd funding for REV Demo projects. Australia DMIA funding is based on an average of hypothetical allowance of selected companies. Sources: AER Determinations Attachments 1 – annual revenue requirements; CES-21 Annual Report 2016; Ofgem, RIIO-GD1 Annual Report 2015-16; Ofgem, The Network Innovation Review: Our Policy Decision, March 2017; Xcel Energy, RDF Annual Report 2017; CA IOU websites; NYSERDA Financial Statements March 2017; New York DPS Order in Case 16-E-0060; Massachusetts DPU 17-05 Order. UK, Ofgem, RIIO: A New Way to Regulate Energy Networks: Final Decision, (London: Office of Gas and Electricity Markets, October 2010), online: <https://www.ofgem.gov.uk/ofgem-publications/51870/decision-docpdf>. UK, Ofgem, Decision and Further Consultation on the Design of the Network Innovation Competition, (London: Office of Gas and Electricity Markets, 2 September 2011) at 4, online: <https://www.ofgem.gov.uk/sites/default/files/docs/2011/09/nic-consultation.pdf>. UK, Ofgem, Innovation in Energy Networks: Is More Needed and How Can This Be Stimulated? (Working Paper No 2) (2009) at 11, online: <https://www.ofgem.gov.uk/sites/default/files/docs/2009/07/rpi-x20-innovation-working-paper_final-draft_0.pdf>. UK, Ofgem, Infographic: The energy network, 28 September 2017, online: <https://www.ofgem.gov.uk/publications-and-updates/infographic-energy-network>. UK, Ofgem, Electricity Network Innovation Competition Governance Document, (London: Office of Gas and Electricity Markets, 1 February 2013) at 5, online: <https://www.ofgem.gov.uk/ofgem-publications/53526/spnic-pdf>. Decision and Further Consultation on the Design of the Network Innovation Competition, supra note 6 at 2. UK, Pöyry, An Independent Evaluation of the LCNF, October 2016. Based on a discussion with Jonathan Morris and Neil Copeland of Ofgem. Electric Program Investment Charge, Staff Proposal, 10 February 2012, Rulemaking 11-10-003 at 9- 10, 17; D.12-05-037, Phase 2 Decision Establishing Purposes and Governance for Electric Program Investment Charge and Establishing Funding Collections for 2013-2020, 24 May 2012 at 6, online: <http://docs.cpuc.ca.gov/word_pdf/FINAL_DECISION/167664.pdf>. New York Public Service Commission Staff Recommendation in Case 99-G-1369, 31 January 2000. US, HF 1437, 2015 Jobs and Energy Bill, 89th Leg, 4th Engr, Minn, 2015, at 66, online: <https://www.revisor.mn.gov/bills/text.php?number=HF1437&version=4&session=ls89&session_year=2015&session_number=0> [2015 Jobs and Energy Bill]. Australian Energy Regulator, “Regulation that supports innovation, demand and consumers” (Presentation delivered at the Disruption & Energy Industry Conference, 7 September 2017), online: <https://www.aer.gov.au/news/regulation-that-supports-innovation-demand-and-consumers-presentation-to-disruption-the-energy-industry-conference-sydney-7-september-2017>. Caldwell, Yardley, Coyne, supra note 1 at 32. History is peppered with detrimental ‘trends’, such as the monetary stimulation by many central banks that contributed to the stagflation of the 1970s and was ultimately reversed at considerable costs. The present forces towards ‘illiberal democracy’ (an oxymoron in and of itself) represent a trend for which we may pay dearly. See, e.g., D. Dimitropoulos and A. Yatchew, “Is Productivity Growth in Electricity Distribution Negative?” (2017) 38:2 The Energy J 175. A similar separation of pipes and gas supply had proved critical in promoting competition in the natural gas industry.